Can of worms = open. Our back deck definitely needed railings, and I tackled that here. Always nice when petty bureaucrats get to tell you what to do…not due to rules or whatnot…but simply because they can. Anyway, we finished the deck railings, and now it’s time for the front porch. Just bang some railings together, right? Heh…not so fast. 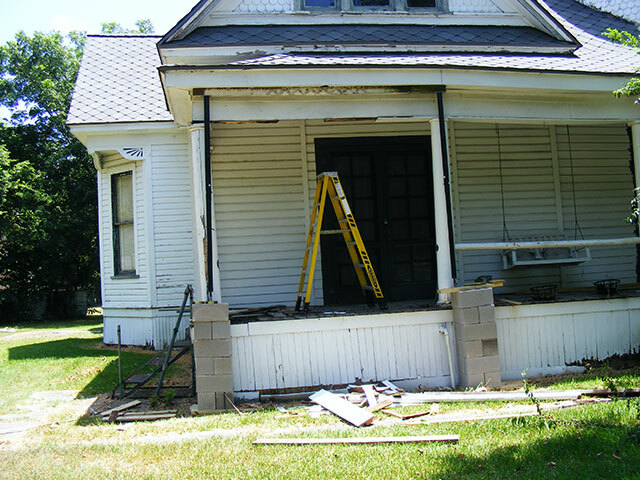 I *could* do that to satisfy the insurance company…some aluminum cheap crappy something or other wire-tied to the columns…but I don’t want to do things twice so the job needs to be done right. It’s important, especially when adding lots of new vertical and horizontal elements (the new railings) to the house, that everything be straight. 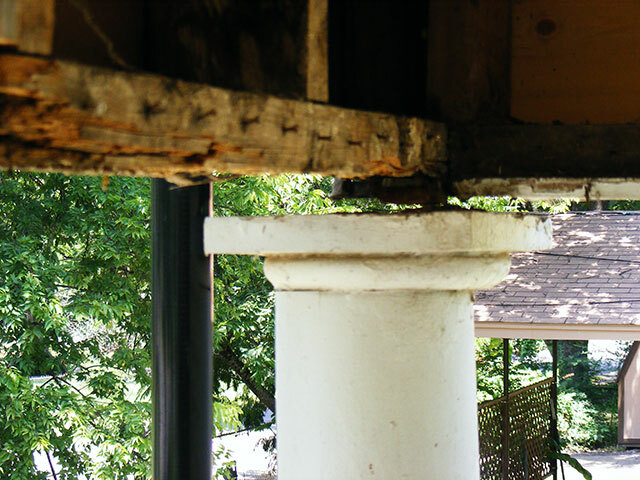 Since we have a couple columns that are damaged at the bottom or sunken into the porch deck, we need to start with getting those right, as well as leveling the porch header and deck. 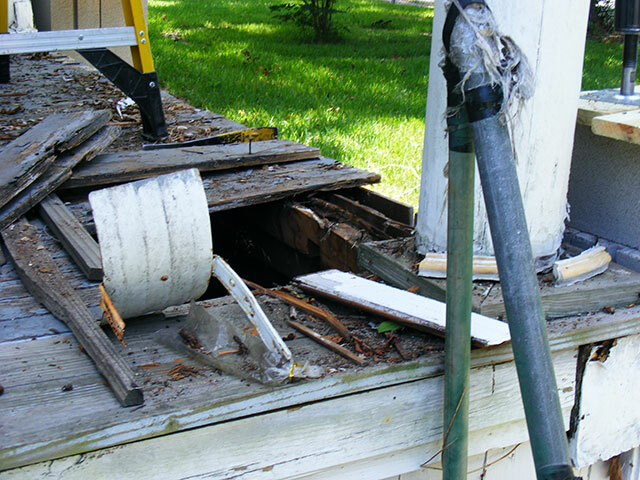 I spent some time this weekend just doing preliminary stuff…checking the structure…playing with the jackposts to see if they were up to the job (they are), and uncovering stuff to see what kind of lumber I need to pick up. Lots of measuring and running about with a level and I found the “set point”…the spot I need to level everything else up to. The “set point”…this is the height that everything else gets to match up to. 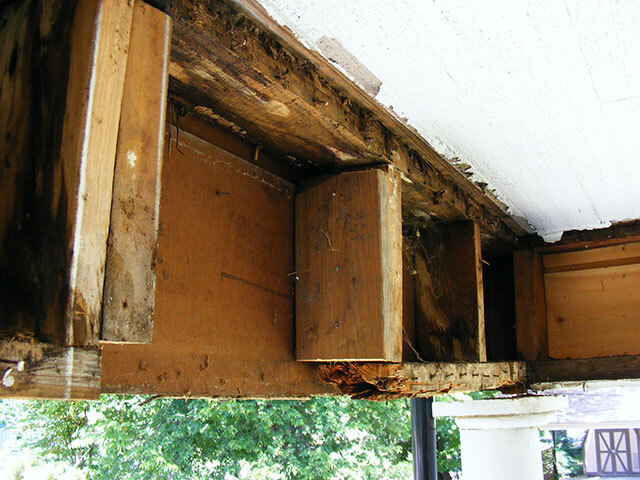 There is a lot of old damage here…and it was never really a solid header to begin with, so I will completely rebuild the porch header…with an actual header. The header was warped…obvious why once the covering was removed. I want this straight and level. 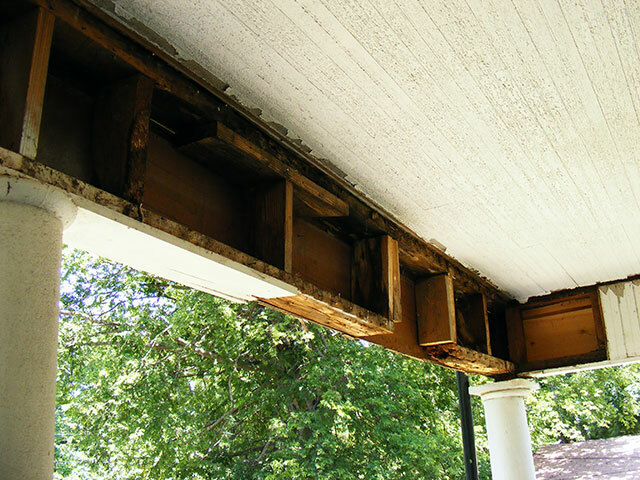 We knew the porch deck was shot…and already found a wolmanized tongue and groove to replace it in the original style. 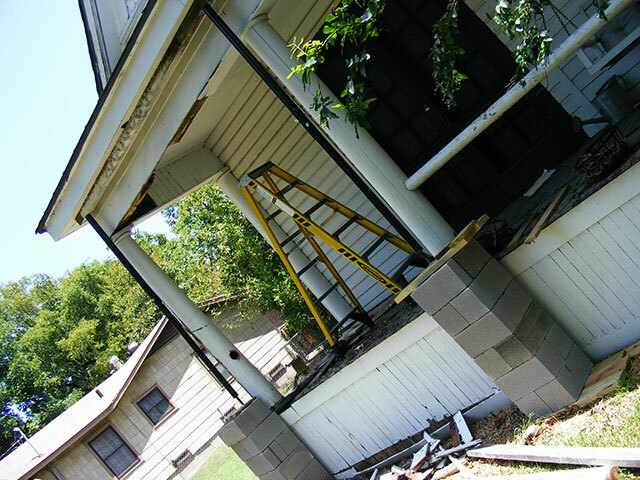 The question was how much of the porch structural lumber we would need to replace. Not too bad…mainly the outer beam. 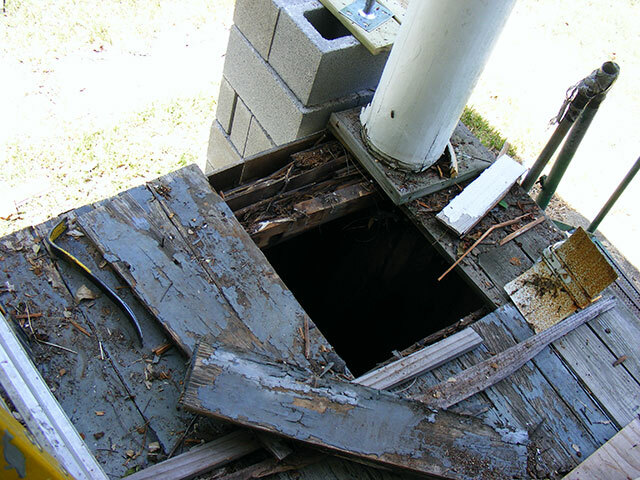 So…next weekend I’ll start with some lumber and a big box of screws and do some structural rehab. A new header will be up first. I expect in this heat…that will take a day. Then I’ll tackle the deck structure. I have to do both before I can fit a new column. I will end up doing this one section at a time (column to column). The real bear’s gonna be the curved sections!